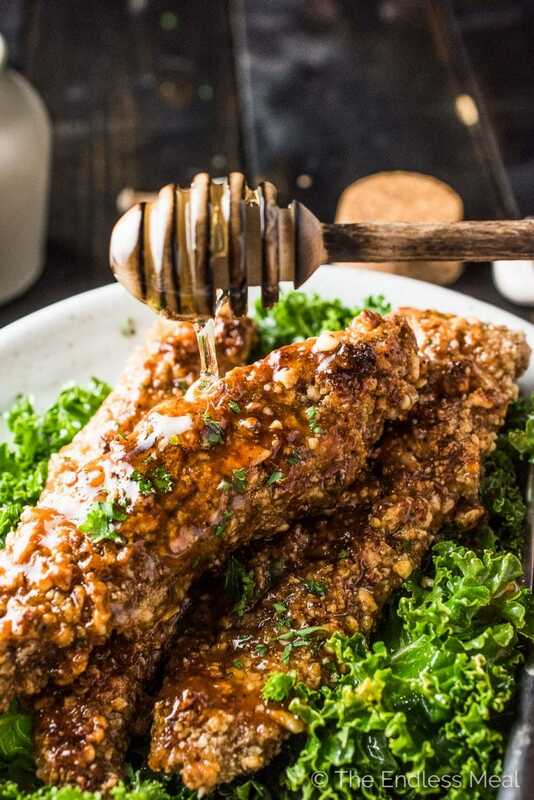 These sweet and sticky Paleo Honey Garlic Chicken Fingers are as good as they get. They're coated in a delicious almond flour crust then dunked in a honey garlic sauce. They're a quick and easy, healthy dinner recipe your whole family will LOVE! I'm about 100% sure you can tell by looking at the picture, but I'll say it anyway. 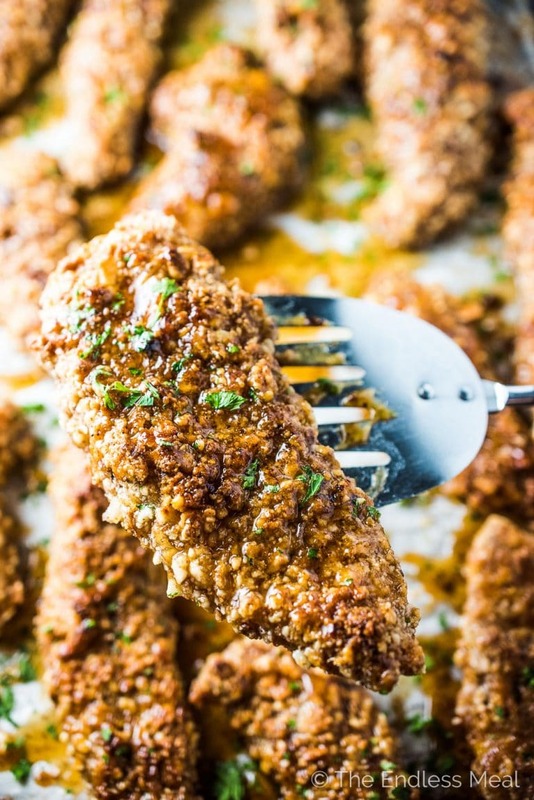 These Paleo Honey Garlic Chicken Fingers are AMAZING! That's right, these sweet and delicious chicken bites are a healthy paleo recipe. Gasp! They're made with an almond flour crust that is both gluten-free and paleo. They're baked until they start to crisp then coated in an easy to make (and super delicious) honey garlic sauce. If you're thinking that these chicken fingers look a little familiar, you've probably seen my Sweet and Spicy Paleo Chicken Fingers recipe. I based this honey garlic version off of them. Since I shared that recipe three years ago, it's been one of the top 10 most viewed recipes on the blog every month. It's such a delicious recipe that I wanted to use it as a base for other chicken finger flavors. 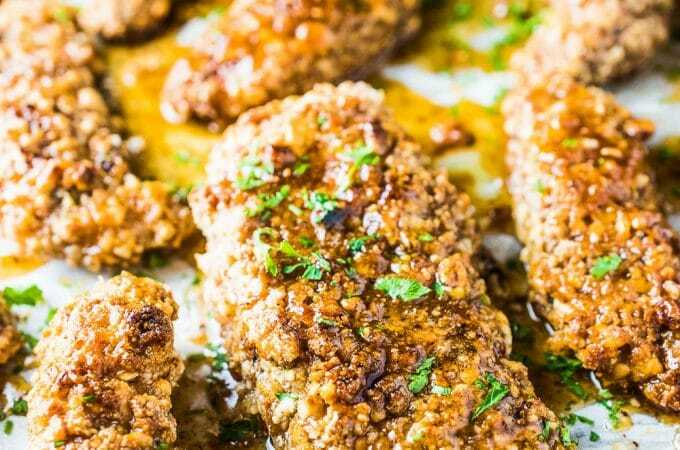 This paleo honey garlic chicken fingers version is rocking my world right now. This is a recipe that we've made several times and each time we've devoured them. Our little girl is as big of a fan as we are. It's hard not to love that sweet and savory combo. I think what I love most about this recipe is that it tastes like something that shouldn't be healthy, but it is. When I eat it, it feels like a total treat. Like one of those childhood favorites that you have fond memories of but don't want to eat because it's not good for you. The only difference is that this IS good for you. It's made with all natural ingredients and it's paleo and gluten-free. Winning all over the place here. The sweet and garlicky sauce is insanely delicious. If you forget to use your fork, you'll be licking your fingers for sure. Even if you use your fork, you'll want to lick every delicious drop of the sauce out of the pan. Fingers work best for that task! 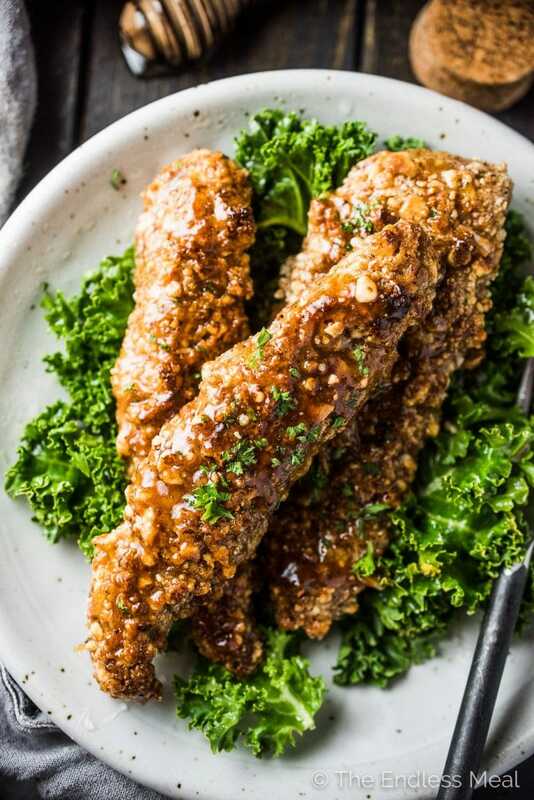 I normally like to serve these paleo honey garlic chicken fingers with a giant kale salad. Kale can handle the sweetness of the chicken and when some of the sauce mixes with it, the kale becomes even more delicious. If you've got kids who are afraid of salad, some yam fries make a healthy and tasty side. 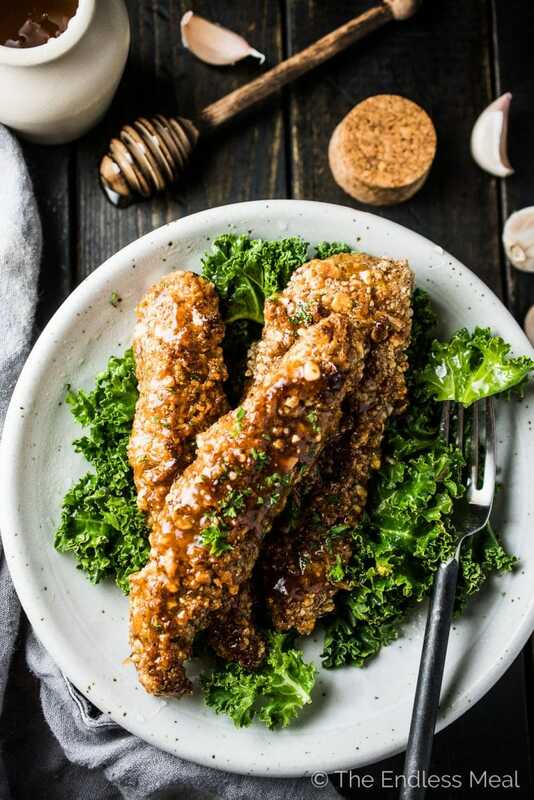 If you love these Paleo Honey Garlic Chicken Fingers as much as I do, make sure to leave a 5-star rating in the comments below! Place the almond flour, sea salt, and black pepper in a bowl and stir them together. Place the eggs in another bowl with a splash of water and whisk. Place the tapioca flour into another bowl. Dip the chicken tenders, one at a time, into the tapioca, then into the egg, then into the almond flour. (Keeping one hand for the egg and one for the starch and flour makes this a lot less messy.) Lay the chicken tenders on the prepared baking sheet. Bake the chicken for 25 minutes, or until it is crispy and beginning to golden brown. While the chicken is baking, prepare the sauce. In a small frying pan over high heat bring the honey, garlic, sea salt, and (if using) the cayenne to a boil then set it aside. These are so good! I’ve made your sweet and spicy version before and love them too. So happy you like both of them!! Based on your recommendation, we went ahead and tried these and loved them! Now we do half and half between the two sauces and it’s great to have a mix of different chicken tenders for dinner. Thank you again!! I love it! So happy you like them both! This looks delicious! I have all the ingredients and making tonight, but can’t decide between this one and the sweet and spicy tenders… do you have a fav? I’m way too indecisive! Oh man … that’s a tough call! I honestly love them both. I love these ones because of the garlic and the other ones because they’re spicy. Haha I can’t choose either! Maybe make a half batch of both sauces so you get some of each! Thanks for the reply! I couldn’t decide either, sooooo I just combined them! I followed the recipe for the Sweet and Spicy version, but added the 4 cloves of fresh garlic (and omitted garlic powder) and added the salt as well. It was soooo good! If you are ever indecisive like me, just combine them! My fiance loved it! We took your recommendation and served it over a kale salad that i rubbed with a little avocado oil and lime juice. I added in some red onion and topped with a drizzle of homemade paleo ranch and it was perfect! Thank you! Such a great idea! I may just have to do that next time, too!! I made these last night, and they were perfection. That 3-step dredging makes all the difference, and it’s the tapioca starch that really makes the chicken perfect. We loved this! In fact, all your chicken dishes we’ve tried have been top-notch. This is going on repeat. I’m so happy to hear you liked them … and my other chicken recipes! Hooray! These look amazing. I don’t have tapioca flour though. Is there a substitute for it that you can recommend? Any starch will work, it just depends on if you follow a paleo diet or not. If you do, then arrowroot powder could be substituted. If you don’t, then you could use rice flour, cornstarch, or even regular flour. I hope that helps!